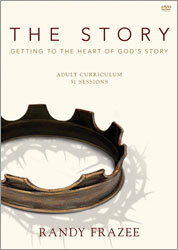 The story DVD curriculum offers groups of all sizes the opportunity to learn, discuss, and apply what they experienced during their 31-week The Story church-wide experience. Pastor and author Randy Frazee presents 31 ten-minute teachings on how the story of Scripture - God's great overreaching purpose - intersects with the story of your life. Bestselling author Max Lucado also adds some introductory insights.